I’m a big advocate for better understanding customer needs, particularly in the jobs-to-be-done form. Companies should spend more time on this, instead of the all-too-common approach of implementing someone’s vision in a near vacuum. Although I admit it isn’t easy to do. Focus groups are a start, but are both logistically and financially hard to scale, and fraught with their own issues. So the state of getting customer insights is still fairly immature. See there? AmEx wants to better understand my needs. Charge cards fall into that overall payment realm which includes PayPal, Square, Stripe, Google Wallet, etc. It’s a deep part of our society and something we can all relate to. When I am purchasing something, I want to provide payment to the seller. Success means I complete the purchase. But is that all there is? No, of course not. I have jobs around paying off AmEx, understanding my spending habits, merchandise assurance, along with emotional ones like a feeling of assurance I can buy when I want to. AmEx even works on fulfilling a status-based job-to-be-done. Extending out from there, there are adjacent jobs related to the purchase decision process before the transaction and better understanding my financial activity after the transaction. Heck, I’ll bet AmEx could come with more areas where I have relevant jobs-to-be-done. Now, if you look at those three screens, that’s a good amount of setup. An intro screen, a list of “helpful hints” and finally confirmation of the product I’m using. Feels like I’m about to undergo a weighty exercise. A net promoter score question. NPS has become more and more popular, and is a simple report card on how your customer perceive your product or service. Customers who click 9 or 10 are called Promoters, 7 or 8 are Passives, and 1 to 6 are Detractors (read more on net promoter scores). For the record, I picked ‘7’. AmEx is a fine card, but in my wallet I can’t really distinguish it from my Visa or Mastercard. It’s the only charge card Costco takes, so I can recommend it based on that. But a broader question occurred to me. 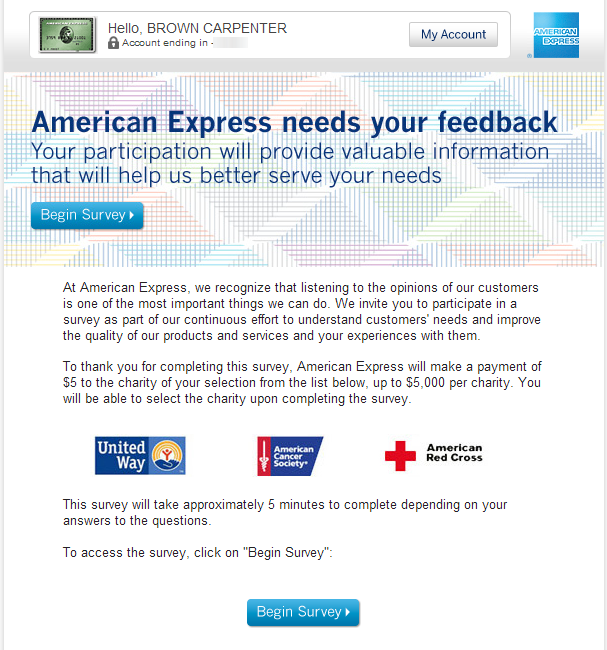 What will AmEx do once they have all the NPS’s collected from customers? Say the NPS comes in averaging ‘9’. They’re done, right? Pretty much nailing it. If it comes in around ‘7’, they’ll wonder what is wrong, why people aren’t more gung ho. Assuming they will take action based on the NPS collected from us customers, I can see a few paths here for what happens next. Marketing focus: Product is fine as-is, it’s the messaging around it that we need to improve. Also, we’re not reaching customers where they are. TV is declining, we need new ways to get across why our card is better. That will get our NPS’s up. Internal product development focus: Work on ways the card features and experience can be improved. Smart people work at AmEx, and they can come up with some interesting approaches. Focus group the ideas after they’ve honed them down to a few. That is, get customer insight after the fact. Jobs-to-be-done focus: As Steve Blank espouses, there are no facts inside your company’s walls, get outside of your purely internal focus. Initiate a program of exploring jobs-to-be-done by customers. Incorporate customer wants into determining the design of new products. This is insight before committing to any ideas. Indeed, the NPS is a great first cut on identifying customers to approach about getting deeper insight. 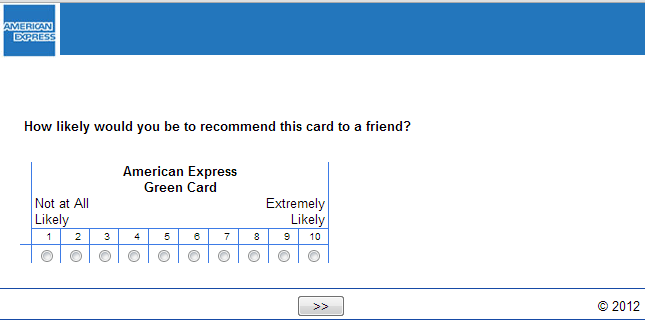 Each person’s NPS is essentially a window telling you how well AmEx Green matches their particular jobs-to-be-done. What do you think AmEx will do next?